Archives of Eaton Bray News for the Category/Tag Village Hall. This article was published in June 2018. Please see Latest News for more recent information. This article was published in January 2018. Please see Latest News for more recent information. Sundays 16:00 - 17:30 in Eaton Bray Village Hall. New Beginner Course starts 4 February 2018. Book your place online. For more info visit www.eckaeatonbray.com or phone Sensei Simon on 07500 007779. This article was published in May 2015. Please see Latest News for more recent information. 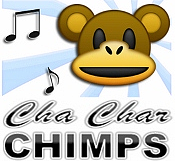 Cha Char Chimps are a young childrens' interactive, musical entertainment show and they will be coming to Eaton Bray Village Hall every Monday from 8th June (except school holidays & 29th June when it's being used for something else). From 10:30-11:30am. Mums, dads, grandparents, childminders all very welcome. No need to book, just turn up (£4 for 1 adult & child or £5 for a family). Drinks and cakes included in the refreshment break. They have been running in Milton Keynes for 7 years and have noticed ladies travelling all the way from Dunstable, so we are coming over to your way now! Hope you enjoy it! For more information, please see the Cha Char Chimps website. This article was published in May 2014. Please see Latest News for more recent information. Comic Potential is set sometime in the future when actoids replace humans in the filming of soap operas. When the want-to-be writer Adam, discovers that one of the female robots has developed a sense of humour he decides to use it in one of his programmes. However having a relationship with a 'non human' has its drawbacks! Join Curtain Call Theatre Group this summer for an evening of laughs and maybe the odd tear. Contains strong language. Note: This article describes the 2014 event. For details of this year's Beer Festival, please see Village Hall Events. This article was published in October 2013. Please see Latest News for more recent information. Front Row Theatre Group will be performing Alan Aykbourn's hilarious play Absurd Person Singular at Eaton Bray Village Hall from 14-16 November 2013. Tickets £7 available from the Box Office on 01525 222283. This article was published in August 2012. Please see Latest News for more recent information. Re-surfacing work is scheduled to start on Monday 20th August with a target for completion of 29th August. During this period, the car park will be closed and the Village Hall facilities may not be available at all times. The grass verges will be in a soft state following the ground works and should not be parked on until further notice. This article was published in June 2012. Please see Latest News for more recent information. Honestly, there I not much to say this month except to thank all of you who came to the quiz on the 21st April. This was a sell out and the Village Hall Fund Raising Committee and Tennis Club shared nearly £1200 between them, so again, we hope you had a good time and just to remind you that the next Quiz will be on Saturday 17th November, just give me a ring to book your tickets. Just as Focus hits your doormat in late May or early June, we will be holding the Beer Festival (Friday 1st and Saturday 2nd June). I do hope that I will see some of you there and especially some of the younger folk who will be attending the Tea Party on the Saturday afternoon. This is a great way to bring all the families of Eaton Bray together to help celebrate the Diamond Jubilee. I hope by next month to be able to fill you in on when the Hall's carpark is going to be resurfaced, we are meeting with contractors at the moment to put the finishing touches to our plans, so no more potholes, which I am sure will please us all! 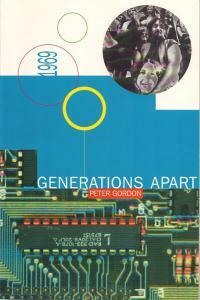 Local group Paradox will be playing live at Eaton Bray Village Hall on 19th May 2012 from 7pm til midnight. You can expect a lively selection of music covering many genres including rock, soul and country from the 1960's up to the current day. This group has a large fan base established. Don't miss the opportunity to see them live and support your local Lions club at the same time. Entry tickets £10.00 bought in advance, £15.00 on the door. Please contact Rachel on 01525 229656 or email [email protected] for more information. Ahoy there me hearties! 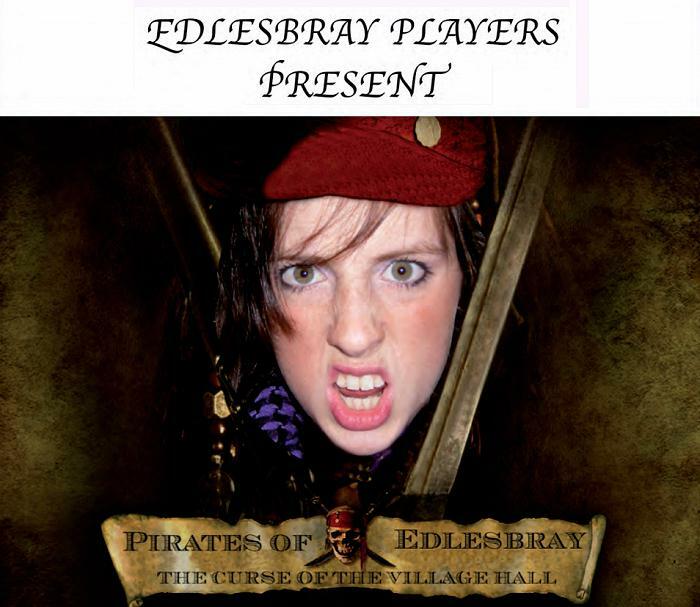 The Pirates of Edlesbray (The Curse of the Village Hall) sets sail at the end of this month and a good time is expected to be had by all. This year's festive family show at Eaton Bray Village Hall is based on a theme of pirates in response to requests from the public after this year's St Mary's village carnival when the theme was also buccanneer based. It has been written by director Bekka Prideaux and her partner Joe Butcher who many will remember from past productions and many successful appearances for Dunstable Rep at the Little Theatre. Pirate captain Jerk, played by Matt Flitton, is tired of pirating and is looking for a replacement to take charge of the infamous pirate ship The White Opal. A motley collection of characters from a selection of pantos turn up to audition for the job. A variety of tasks is set to weed out the wheat from the chaff, and those who fail will be forced to walk the plank. Those who triumph go through to the next round. Unfortunately, as with all pantos, nothing is straightforward and Davey Jones (played by the larger than life Jo Butcher) wants the ship for himself. He doesn't want to go through the selection process and has his own plan to take over the ship! As the cast sing and dance their way through the show there should be plenty to entertain all ages and tastes. The Pirates of Edlesbray runs from January 26-28 including a Saturday matinee. There is a licensed bar in the evenings run by the new Eaton Bray & Edlesborough Lions group, with all bar profits going to the charity Medical Detection Dogs which uses dogs to detect cancer, warn of the onset of epileptic attacks, the onset of low blood sugar for diabetics. For tickets call the box office 01525 222283. 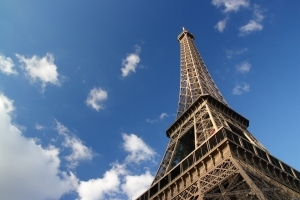 Three ladies of a 'certain age' gravitate to Paris. A retired headmistress, a recently widowed - and liberated - lady, and a divorcee in search of eternal youth indulge in activities which lead to some real comedy as well as pathos. This play will leave you charmed, amused, thoughtful - and singing! This article was written in 2011. For up to date information about the Society, see the Eaton Bray Cinema - Focus On Film Society pages. We started our sixth year on Monday 12th September. We meet in Eaton Bray Hall on the second Monday of each month at 2.00 pm. We have nine films shown between September and May. Membership still costs only £32 payable in two instalments in September and January. Films are chosen by the members. After each film we serve tea and biscuits and there are slips to put in suggestions for future films. We currently have about 40 members but still have room for more. 20 mins Lower Body and 20 mins of Abs & Relax! New 6 Week Course starting Oct 2011 - call now to book! BODY BOOST Also offers one to one Pilates & Personal Training, Small Groups at your Home, Nutrition and Weight Management Advice and Fitness at Work. Please see the website or call for more info. Just £9 per person. Teams of up to 8 people. Fabulous prizes! This article was published in August 2011. Please see Latest News for more recent information. 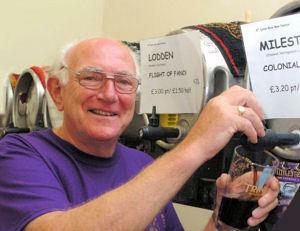 The Eaton Bray Beer Festival attracted its biggest ever crowd last weekend. The warm weather and sunshine on Friday and Saturday meant more than 560 people turned up to enjoy the eighth running of this annual event. Live music, good food and of course numerous ales chosen by CAMRA members, plus ciders and a perry were enjoyed during the event, held at the village hall. Organiser Ross Bagni said: "It was absolutely brilliant. We had a lot more people than last year and I’m sure we sold more beer. "We started with 25 barrels and ended up with about eight. The aim of the beer festival is to sell everything so we did well. "The lighter summer beers were most popular because of the heat, but there was very little left." The money raised by this event will be put towards improving Eaton Bray Village Hall. Note: This article describes the 2011 event. Last year we did not run out of beer but, still sold more of it. We sold more burgers and hot dogs, we sold more food from the kitchen, but we sold less lager and wine! What does this tell us? It means that more of the good people of Eaton Bray and Edlesborough are growing to appreciate the Real Ale, as chosen by our good friends from CAMRA. Only last week a few of us had to attend a meeting with Roy Chatto and his friends (the beer experts), so over to Dunstable and the Globe pub we went. Obviously we had to have a couple of pints of real ale so we could talk about logos and the possibility of our own Festival glasses! I don't think people realise the efforts we go to in order to make the event a success!! We will be having live music both nights and a family entertainer on the Saturday afternoon for the younger folk, so do come along and join in the fun. There will be 25 barrels of beer, 2 types of cider, plus perry (pear cider to the uninitiated; really refreshing if a bit alcoholic). Whilst writing this article in early April, I notice that we have sold 160 tickets for the quiz on April 30th, which we hold jointly with Eaton Bray Tennis Club. I hope another good night will be had by all. We really appreciate people coming along, as when we decided on the date we had no idea that Prince William and Kate Middleton would be getting married the day before. When the government decided to make this day a public holiday, we wondered, whether a lot of people would go on holiday after Easter and miss the quiz. However, in true local style we are nearly booked out with 4 weeks to go. Thank you all for your support. Winners of the quiz will be announced next month but, please don't forget the BEER FESTIVAL. If you need anymore information Please call me (Ross) on 221411. Firstly a timely reminder of our next Super Quiz that is being help on Saturday 30th April in the hall. We have also kept the price at £8 per person which as you know, also includes the best ploughman’s this side of Edlesborough! As usual we have the master Quizmaster Mr Keith Blackburn, who offers up amazing questions to tickle the old brain. I personally will be memorising the names of all the attendants/bridesmaids at the Royal Wedding and hope he asks us to list them in alphabetical order! If you require tickets please let me know and as usual I will be offering two free tickets to the first person to ring me with the correct page our advert appears on in Focus. I will probably be away at the time (4th – 7th April) but be assured the answer machine records all messages in time order. Just so you don’t think Shelagh and I are off on holiday I can assure you this trip is mostly business! On the more mundane side of things we are planning the new car park and hope to go ahead with this project as soon as possible, maybe with following wind, even this year, although we do not want to make any promises we cannot keep. 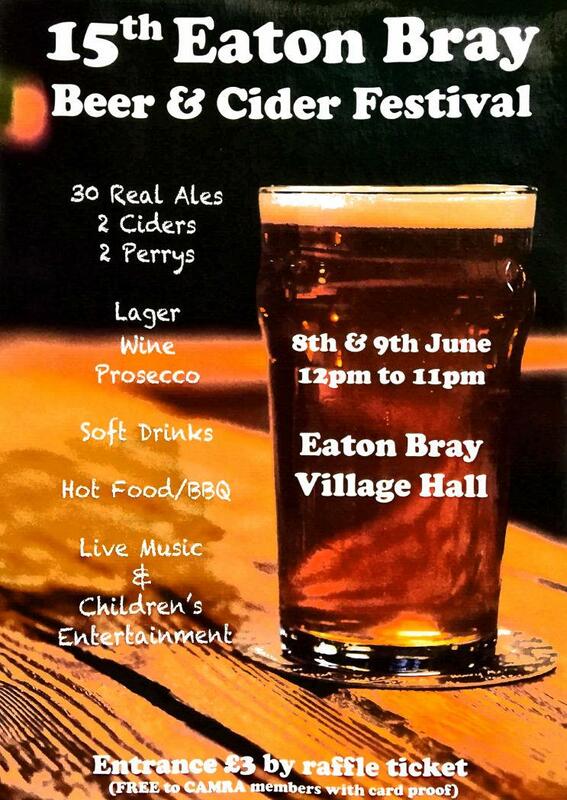 Our next big event, to help pay for this, is the 8th yes 8th Eaton Bray Beer Festival, to be held on Friday June 3rd and Saturday June 4th. We will have the usual entertainment and food along with an even greater variety of beer, perry and cider. We look forward to seeing you all there. To buy tickets for the quiz or just for more information please contact Ross. Join Pete Langford and Butch Baker of the Barron Knights for an entertaining evening of lively music, chat about the group's history and lots of laughs. Come early and join the boys in the bar for a chat! Following the interval, the stage will be taken by Mr Kite's Benefit Band (Hertfordshire's Premier Charity Group) playing dance music from the 50s to the present day. Mr Kite's Band only play for special causes and we are privileged to have them in Eaton Bray to support Iain Rennie Hospice at Home. 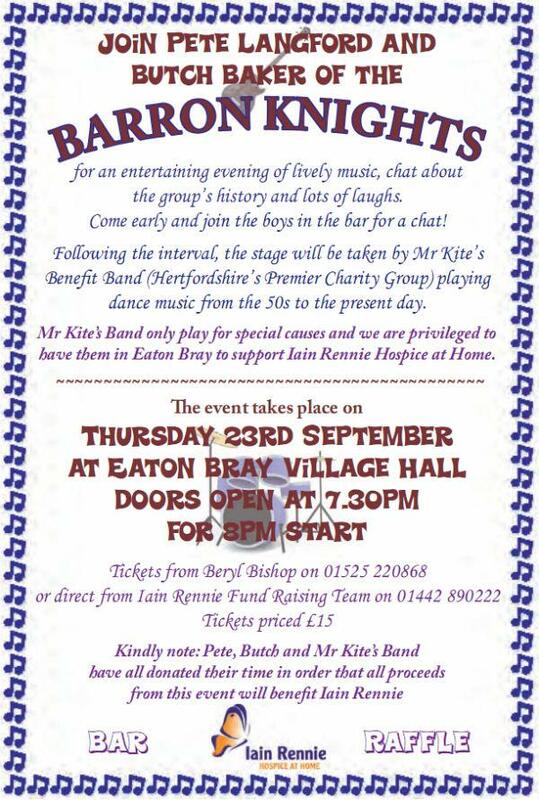 The event takes place on Thursday 23rd September at Eaton Bray Village Hall. Doors open at 7.30pm for 8pm start. Tickets from Beryl Bishop or direct from Iain Rennie Fund Raising Team on 01442 890222. Tickets priced £15. Kindly note: Pete, Butch and Mr Kite's Band have all donated their time in order that all proceeds from this event will benefit Iain Rennie. I hope you haven't missed it!! Note: This article describes the 2010 event. That's the Beer Festival I am talking about. It is on Friday 4th and Saturday 5th June. I won't go on about it but if you do get to read this after the event I do hope you had a good time. I know I did, although I was made to have a shower before going to bed as the smell of burgers and onions apparently is not acceptable in the bedroom. Not sure why? Next month I will let you know how we really got on. It is so much easier with the facts, rather than having to anticipate what we did a month ahead of the event. I do hope you are following all this as I am now completely lost! What I do know is that the Quiz on the 24th April was a great success with “Not Maggie's Friends” (feel sorry for Maggie but that's the way it goes) winning a very close contest and just behind, in their usual place “Mary's Girls” came a very creditable last and collected all the chocolates! Between us the Village Hall and the Eaton Bray Tennis Club shared over £1,100. Once again we must all thank Keith Blackburn for being,without doubt, the best Quiz Master in the Village. So thank you to all that came and we look forward to seeing you all again on the 23rd October. N.B. I have already sold the first 5 tables so please book early. For some year now we have been running the Village hall 200 Club which started with 200 members and paid out £200 a month in 5 prizes. Over the years the membership has dropped slightly so we are taking away one £25 prize. The odds are still the same and value of prizes is still 50% of the total income so nothing is really changing that much. Thank you all for your support over the years we have between us put in over £10,000 in to helping the renovation of the hall. This article was published in December 2009. Please see Latest News for more recent information. You may think that it is bit early to be talking about Spring, but if you think about it, this is the last chance to talk to you before the February edition so I make no apologies in forewarning you of this fabulous event. The same team that bring you the masterful Quizzes twice a year are at it again. We (that is the Village Hall & Tennis Club but I am sure you know that) thought what a wonderful idea to give you the chance for a dance. We have organised a live band, Jim Balls and The Racquets. That is the Tennis club's infl uence, and they play our sort of music! Whilst the caterers are preparing a sumptuous two course meal, a choice of two main courses plus sumptuous desserts. (I suppose they are not actually preparing it now, probably on the day). What have you got to pay for all this? Just £16 if booked by the 14th February or £18 thereafter. That is a real credit crunch beating deal! Well what about the quiz held on the 10th October, as you may remember I was absent (due to sister's in law 60th, is the apostrophe in the correct place? I am never sure; answers on a postcard please........). I hear that it was a great success and as usual was all the better for my absence. May I thank you all for coming and all those helpers who made it such a splendid success. Our greatest thanks must be to Keith Blackburn who continues to create the quiz questions for us all to enjoy. Don't forget after the Dance comes the next quiz in April 2010, more info in the next edition of Focus. One last thing before I stop. The Village Hall front is being renovated and by the time you read this will be looking very smart indeed. You can see where the Village Hall is spending the money. Thank you all for your support throughout 2009 and we hope you will come to our Dance and Quiz in 2010, enjoy yourselves and help keep the improvements coming at your Hall. This article was published in October 2009. Please see Latest News for more recent information. I know our twice yearly quiz (held jointly with the Eaton Bray Tennis Club) is popular, but can you believe it as I write this, on September 8th, we are already sold out for the Quiz on October 10th! What can we say, but thank you to all our fabulous supporters who have rallied round and done the business. And a really big SORRY to those of you who had wanted to come, but, we are unable to fit in. See you there, don't forget 7.30 for 8.00pm. On a very sad note I am sure many of you know of the passing of Mary French. She had been a keen supporter of the hall since its building and was, until only very recently, a trustee. She taught me a lot when I joined the trustees, as she was a “doer” not a talker and did many things to support us. Recently she gathered many members to the 200 Club and collected their monies on a regular basis and I hope that they will continue with their support for the “Club”. She always organised a team for the quiz which, always managed to come last! We are sure they only did this to collect the special booby prize, which is usually some nice confectionery! We are delighted that Mary's ladies are coming to the quiz and we wish them the best of luck in trying to maintain their record! You may have noticed that the inside of the hall has been repainted and that we have a new sign over the front door. We are really trying to make sure that the hall is kept in excellent condition. We will hopefully start work on redoing the paving at the front, so the entrance is user friendly and a lot smarter than at present. We know that the car park needs a lot of attention, but that will be very costly so we need to keep fundraising. We will be announcing further fund raising events next month, do keep a look out for more information. If you have any queries or just want a chat about the hall, contact me, Ross. Experience Pilates the Body Boost Way. You'll leave feeling Relaxed, Refreshed, Fully Stretched and wondering why you didn't join sooner! Body Boost is dedicated to providing High Quality Pilates Tuition; Classes run each week and are designed for all levels including beginner. Posture is re-taught with each class enabling greater understanding and execution of the techniques. Level of work can be modified based on individual skills, strength and ability. As you progress you will become aware of your bodies strengths and weaknesses and learn how to balance those differences and bring the body back to alignment. For more information, see www.bodyboostuk.co.uk. New Beginners Class started on 2nd September at 7pm. Would you like to know the difference between a hip drop and camel step, then why not come along to the Beginners Egyptian dance class held every Wednesday at Eaton Bray Village Hall, all you need is a great sense of fun! Over the weeks in the class you will learn the basic dance steps. From ancient times this style of dance has been done traditionally by women, and is also known as Raqs Sharki. It is now one of the best ways to keep fit and supple, because of the gentle movements it is ideal for all ages - whatever shape or size you are. So don't just sit in and watch TV on Wednesday evenings join me at the Village Hall, and I promise you'll have fun and you hips will do things you never thought was possible !! Wear comfortable clothing i.e. T-shirt and leggings or a long skirt or anything that lets you move without restriction. Cost of class is £2 per person. This article was published in August 2009. Please see Latest News for more recent information. Firstly as we are getting into the summer holidays and this is the last Focus until October I think I had better mention the Quiz. This is being held in the Hall with the Tennis Club and tickets will again be just £8. So please book early to avoid disappointment. We have already sold 4 tables after I was accosted at the Beer Festival by one of our regulars who booked 3 tables on the spot. Thank you John! See, not only are the folk of this village intelligent but they enjoy a good drink now and then. I am, as usual, asking the editor to put an advert re the Quiz and the first person to ring me with the correct page number will be eligible for two free tickets. So go on and give me a ring, you will only need another 6 to make up a team! Remember if you cannot get up to 8 don't worry as we will make up teams and you get to make some new friends as well. The hall is getting along fine with only Monday evenings free (most weeks) at the moment, so if you need a meeting place on Mondays then just give Norman Lee a ring, to see if he can help you - 222831. Obviously there are also plenty of various times available for all those special parties and celebrations. The final figure from the beer festival was nearer to £3,600 so almost a record and it would have been if we had had a few more beers and the weather had been kinder. Thanks you all for your continued support. For any further information please ring Ross Bagni 221411. This article was published in May 2009. Please see Latest News for more recent information. Anybody who wanders into the church hall in Eaton Bray on the first Sunday afternoon of the month will be in for a treat, for that is where the members of the Bedfordshire branch of the 16mm Narrow Gauge Railway Modellers hold their monthly get together and demonstrate their locamotives and rolling stock. The models, which are steam powered - some using coal or a fuel - are 1/19th of the size of the real thing. Some members have purchased the engines, carriages & wagons ready made, some are built from bits - but a few are scratch built & represent thousands of hours of painstaking work. All represent a wonderful spectacle as they chuff their way along the 32mm gauge track. Most members have a general interest in narrow gauge railways & their models are based on a "feel" for the prototype. In some cases members focus their interest on a particular narrow gauge railway - such as the famous Ffestiniog Railway in North Wales - and set out to model all aspects of their chosen line. But above all the pleasure comes from running a working, live, steam engine. So why not call in and on a Sunday afternoon and enjoy the spectacle. You may even want to become a member! The next meetings are: May 3rd, May 31st, July 5th & September 6th. This article was published in February 2009. Please see Latest News for more recent information. Christmas was a peaceful time and New Year was heading that way when by beloved wife fell down the stairs and broke her shoulder. We saw in the New Year on the way to the L&D in an ambulance and got home at 3.30 in the morning. The upside to all this? Our guests had done the washing up and all was neat and tidy. Next year we will do the washing up ourselves and miss the hospital trip! Prior to all the excitement, the old GI's took the Dunstable Christmas float out and walked the streets to help boost, both our and Round Table funds. Another joint venture happened at the Panto when once again the one or two GI's who know anything about alcohol will have run the bar. It is really a pleasure getting involved with other organisations to help at their events and all goes to show that we have a great community within our Village. My main objective in this article (probably not an accurate description of this item) is to promote out next main event. Food, Humour and Dance. Our aim is to titillate your palates, make you laugh with our pair of comedians and finish off by getting rid of those extra calories with dancing to live music. A completely guilt free evening!! All this for just £19 per head! That has to be the best credit crunching deal of 2009! Do come along and give those winter blues a shove in the back and have a good time. The event is jointly run by the Village Hall Fund Raising Committee and Eaton Bray Tennis Club. We do hope to see you there and may I wish you all a Happy New Year and may it be better than 2008 in many ways. For further information call Ross on 221411. The deadline for the Focus publication is approaching fast - and it's time to update the village on what has happened, and what is planned to happen down at the Village Hall. A flowing script from the 'Old G.I.' normally entertains focus readers, but on this occasion, the chairman of the Trustees has been coerced into putting a few words together - from the quiet one!! Well, some said it would never happen, some wondered what was happening, and some watched what was happening and a few made it happen - but it gives me great pleasure to announce that, other than a few odds and ends, we have now completed the renovation of the Village Hall! Yes, the 'heart-throb' born in 1964, has had a total face-lift and significant surgery to her interior. She now stands in splendour to face the ups and downs of the 21st century - that's when the current lease runs out. The major renovation programme has been completed over three phases incurring expenditure of over a quarter of a million pounds - all raised locally by numerous fund raising events and donations. It is a credit to all concerned and to the Eaton Bray village and surrounding communities. The hall now has new heating and lighting systems; new flooring and refurbished kitchen and other improvements including facilities for the disabled. It has to be seen to be believed and this is when I say - enough is enough - and extend an invitation to the village community to come and join us at an open evening on Monday 23rd February to see for yourselves, the transformation of the Eaton Bray Village Hall. Before I forget - if you can find a slot in your busy schedule to join us, light refreshments and a glass of wine will be there to welcome you - from 7.30 p.m. onwards. From me, a big thank you to all who have supported us over the past four years, and a thank you to the Trustees who have supported the three phases of the renovation programme - see you on Monday, 23rd February. This article was published in January 2009. Please see Latest News for more recent information. Thanks to everyone in the Four Villages (and beyond!) who sent a donation to Eaton Bray Village Hall through super-Santa and the super-Elves. Super-Santa was able to pass on £140 to the Eaton Bray Village Hall Trustees - and he sent this note to the super-Elves just yesterday! Thanks to everyone who donated to the Eaton Bray Village Hall this year and thanks as well for all the wine, whiskey, beer, coke, milk and mince pies left out for me at Christmas - trust me they went down a treat! Weren't there a lot of Wii's and DS's on the lists this year! I'm glad I bought my Nintendo shares when I did!! This article was published in October 2008. Please see Latest News for more recent information. Enjoy an hour of gentle stretches & exercises designed to work with your body. Pilates helps to tone your muscles, promotes better posture, stronger abdominals, back muscles & pelvic floor. We offer group classes and one to one training, providing the opportunity for everybody to experience Pilates - the Body Boost way. 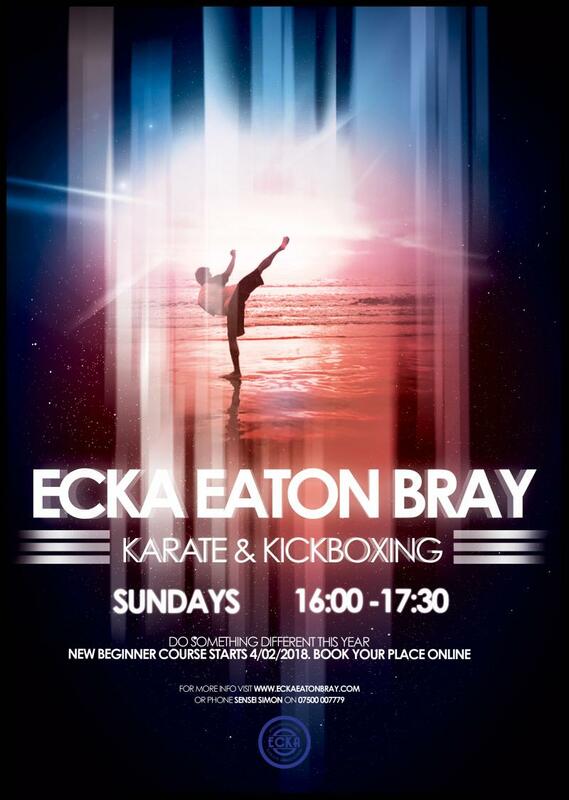 The Eaton Bray class has EXPANDED!, we moved out of the Coffee Tavern into the Village Hall, I am now taking on new customers for this class, if you would like to book, please email. The sequence class at Eaton Bray has also been replaced by a new class "Pilates Plus", which is a rotation of Big Ball, Mini Ball, Dyna Band and Sequence Pilates, this will be a 45 minute session, and will have the same options on levels as the Mat-work classes so are suitable for everyone!! You'll leave your session feeling relaxed, refreshed and feeling great! Well there I was just thinking now that we are past the Carnival perhaps life would get a little quieter, so carried on for a few days just enjoying the beautiful weather, when I suddenly remembered that the deadline for Focus was upon me. A quick bit of writing, send it to Sally only to find that I was two days late and the publication had gone to bed. (he means been put to bed) See how I have picked up these publishing terms since I have written these articles! So here I am making sure that I get this month's entry in, on time. Those of you who have visited the hall in the last few weeks will have noted a lack of a kitchen and lot of mess in the meeting rooms and storage areas. Well, by the time this is published, that should all have been sorted and the hall will even have the new partition in place. If for any reason that is not the case there will be a very sorry builder who will be facing the wrath of our illustrious chairman! My money is on the job being finished on time. That being the case, let me just remind you of the Quiz which is on Saturday 11th October. 7.30 kick off and includes a great supper and fun event for only £8. Our main advert is somewhere else in Focus and the first person to ring me to tell me the exact page will get two free tickets. Hope to see you all there. You know I have been making that offer for at least two years for every event we hold. It is a genuine offer but nobody has ever rung me up, so go ahead and try and win these tickets! Our Race Night is being postponed due to unforseen circumstances but I will be writing later to tell you what else is going to happen in the next few months. For information or bookings for the Quiz contact me, Ross. This article was published in September 2008. Please see Latest News for more recent information. a Free supper with the questions. Bring you own glasses and drink. For bookings contact Ross on (01525) 221411. Beer Festival sets new records! This article was published in July 2008. Please see Latest News for more recent information. Again, at the 5th Eaton Bray Beer Festival we saw record numbers turn up over Friday 6th and Saturday 7th June. As usual, when we met on the Tuesday before the event the weather forecast was horrible. Have we got too many burgers, potatoes, beers, ciders, perry? And I, the panicking old GI, was the most worried of all, but wait, on Friday it got worse, poor Norman dropped something on his shin and had to excuse himself to go to the A & E for a bit of bandaging. Luckily apart from having to miss the event he is now fine. So we all juggled our duties and got going. Saturday it looked dull until about 1pm when the sun came out as did a lot of people, families, serious beer drinkers and a lot of keen amateurs, Fancy trying to drink all 17 ales on offer! When we dragged ourselves away at midnight on Saturday, 464 people had passed through the door and drunk all the beer, cider and perry, which our gallant CAMRA friends had supplied for the event, Over 280 burgers had disappeared into people's mouths, along with 125 sausages and numerous baked potatoes (they never count theirs precisely like us BBQ'ers). A special thanks to Neil Hines who gallantly gave up half an hours drinking time to help us get some more burgers from their shop. A life saver to some hungry drinkers! The exact result will not be known for a few days, but will exceed last years £3,400. This will be going to Phase 3 which starts on August 4th so we will soon have a new kitchen (can we get a permanent BBQ in there Mr. Chairman?) a disabled toilet and a lovely meeting room. Where will we put the rubbish next year? Having cleared the hall out on Sunday morning I spent a very pleasant hour on Sunday afternoon helping my neighbour by sitting on the gate at the Open Gardens event. I enjoyed all the praise about "my" beautiful garden. It was very difficult to admit that I was only the neighbour and had nothing to do with its beauty except to always feel guilty when they are lovingly tending their garden whilst I sit and read a book next door. We are not stopping with Phase 3 as there is still plenty to do at the Hall, Our next event is the Quiz, Saturday 11th October, jointly with Tennis Club. We then get together again on November the 22nd for a spectacular Race Night. This should be a nice change. We also run a 200 Club. This involves a max of 200 people paying £2 each month and every month there is a first prize of £100 followed by 4 prices of £25 each. That is a 1:40 chance of winning. A lot better than the lottery. Do give it a go. Contact me, Ross. 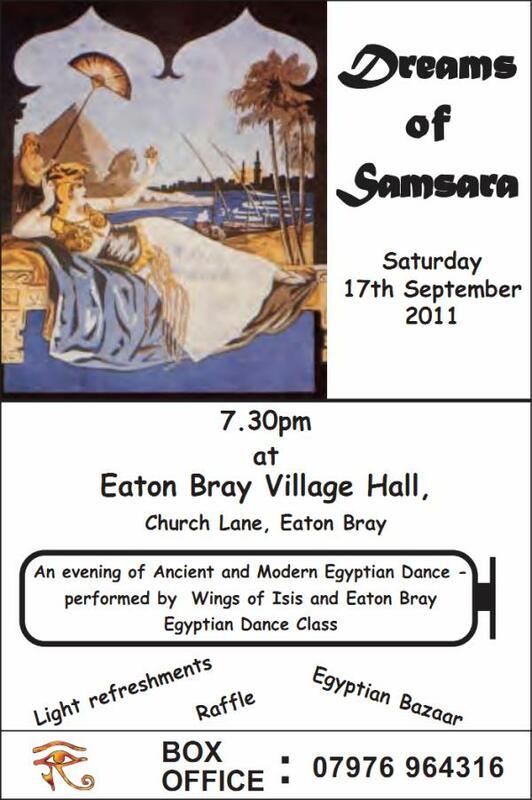 Shimmy, Shimmy - Egypt comes to Eaton Bray! Don't know the difference between a hip drop and a camel step? Then why not come along to the Egyptian dance class held every Wednesday at Eaton Bray Village Hall from 7.00pm til 8.30pm. You don't need any previous experience - just a great sense of fun! Over the weeks in the class you will learn the basic dance steps, progressing onto the more advanced moves of this ancient and interesting dance. From ancient times this style of dance has been done traditionally by women, and is also known as Raqs Sharki. It is now one of the best ways to keep fit and supple, because of the gentle movements it is ideal for all ages - whatever shape or size you are. So don't just sit in and watch TV on Wednesday evenings join me at the Village Hall, and I promise you'll have fun and your hips will do things you never thought was possible !! Wear comfortable clothing i.e. T-shirt and leggings or a long skirt or anything that lets you move without restriction. Cost of class is £4 per person. To book a place or for more details please contact Soraya. This article was published in May 2008. Please see Latest News for more recent information. Note: This article describes the 2008 event. As usual I am trying to think of a snazzy way to start this piece and as usual (as those of you who read my pieces will have noticed) I am failing miserably. So I thought I would start with some basic facts. The Food: BBQ (the best as run by me!) plus baked potatoes and assorted fillings. And all the other usual bits! Other Drinks For those of you who do not like Real Ale or are either too young or driving we will have a selection of lagers, wines and soft drinks. All in all this should make for an excellent couple of days. We do hope you will join us and remember we are delighted for families to come and join in the fun as the bar is in a separate area. All monies raised from the event are going to the continuing refurbishment of the hall. The quiz, which by the time you are reading this, will have happened was sold out by the first week of April with a waiting list. So we are sorry to any disappointed villagers. I have promised to give those people first dibs for our next Quiz on Saturday 11th October. The rest of you don't say you haven't been warned. See you at the Beer Festival. Any further enquires please contact Ross on 221411. A very special event took place on 28th March at Eaton Bray village hall. 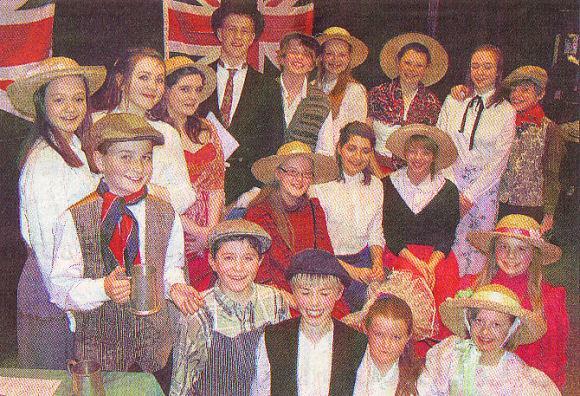 Eighteen young people aged from 10-18 presented a full-scale traditional Old Time Music Hall to a sold-out audience to raise money for the Friends of St Mary's. There was a buzz of expectation as a packed hall greeted the appearance on stage of James Lake who introduced the evening in the guise of the traditional music hall Chairman. Dressed in top hat and tails he introduced each act with witty quips, jokes, alliteration and a bang of the gavel (who remembers Leonard Sachs on The Good Old Days?!). He introduced the 'orchestra' for the evening - Ros Yalden on the piano - with traditional jibes about the quality of her playing but it was all in good humour and she accompanied the performers beautifully all evening. The opening choruses were sung by the entire company and we could tell straight away that we were in for a good evening as the cast danced and sang with great strength and quality - they were all clearly enjoying the experience. They all looked authentic, with period costumes and props supplied by Wendy Ashman, whose husband, Peter, directed the show and provided much of the script. The workload for the evening was fairly shared across the entire company with each performer having at least one solo performance in each of the two acts - that was a wise decision as everyone in the cast was clearly a highly competent performer - there were no weak links. The first half consisted of fourteen separate acts starting with one of the all time greats - Daisy Bell - beautifully sung by Sophie Yalden. Other highlights in Act One included: a cheeky performance of a little known song called What's that For Eh? by Alice O'Neill who had the audience in the palm of her hand; a hilarious comic rendition of the poem The Green Eye of the Yellow God by Heather Mullett whose arm movements were provided by Emily Ann Varley; the Stanley Holloway monologue Runcorn Ferry by Sebastian Calloway (how did he learn all those lines? ); Don't Dilly Dally and Daddy Wouldn't Buy Me a Bow Wow sung by the highly talented Heather and Holly Potten; Cockles and Mussels sung with great conviction by Alex Mustoe; a touching performance of Won't You Buy My Pretty Flowers by Molly Blumsom: and a melodrama which had Freddie Marshall being henpecked by a convincing Melissa Wade before getting his revenge by selling her to the local squire wonderfully played by a joke-cracking William Sanders (who went on to give us a classical guitar solo in Act Two). After such a slick and fast-paced first Act, the audience were ready for their lovely ploughman's supper provided by Val Trantum and her vastly capable team. In Act Two the audience were treated to delights such as I Was A Good Little Girl sung by Olivia Calloway who made several gentlemen's nights by flirting with them from the stage whilst her talented sister Sabrina Calloway attracted whistles from the audience as a scantily clad artist's model in It's Alright in the Summertime. Emily Lake gave a beautiful rendition of the little-heard Shine On Harvest Moon and the half climaxed with a performance of the melodrama The Old Red Barn which had strong comic acting from Erin O'Neill as the wronged Maria Martin and Joe Ashman as the wicked William Corder who ends up killing her - but not before he milked the boos and hisses from the audience. The evening concluded with the Chairman inviting the audience to join in the final choruses in traditional style ("chiefly yourselves") and the entire cast sung and danced such numbers as Any Old Iron and Beside the Seaside with great energy, enthusiasm and quality. The audience went home happy after two and a half hours - nearly a thousand pounds was raised for Friends of St Mary's and they had been entertained by a group of highly-talented young people. There were no 'stars' in this show - every performer was exceptionally strong - they looked good, were well-rehearsed and clearly enjoyed entertaining their audience. When are we going to get an encore?! This article was published in April 2008. Please see Latest News for more recent information. I am sitting in my office looking at the daffodils coming into bloom and thinking what a great time of year it is. No, I had better start again, as actually, from my office all I can see is a tiny bit of the garden and not a single daffodil, but you get the jist of my thoughts? Spring is here and like the rest of us it is a pleasure to behold the spring flowers and the garden coming into bloom. That has nothing to do with the Village Hall except we are getting closer to the building work which we hope to carry out in June, the refurbishment of the kitchen and meeting room plus creating a disabled toilet. This is getting us even closer to my main point. It really is a very strange way my mind works but you may just be getting used to this old man's ramblings by now! Now where was I? Oh yes.... All these works cost lots of money so the old GI's along with our friends from the ultra fit Tennis Club are going to remind you about the Quiz. This will take place on Saturday 26th April in the Village Hall. 7.30pm start and with an excellent supper included in the minuscule price of just £8 each. Bring you own drinks and glasses. With my usual generosity I am offering two free tickets to the quiz for the first person who tells me on what page the Quiz advert is on (subject to the very very very kind editors putting it in!). The telephone number is on the advert. We have run these quizzes over the last couple of years and they have been extremely popular. Do come along make up a team of 8 or if you cannot manage that, we can put smaller like minded groups together and create a super team! (Something like super food, sounds good but no one is sure if they really work). I will babble on about the 5th Beer Festival in the next Focus but just to remind you the dates are Friday 6th June and Saturday 7th June. Make a note in your diary. Don't forget to book your tickets for the Quiz and then keep reading those reference books so you can win a great prize and more importantly the pride of saying "We Won!" Take from someone who has done just that. For any information just call Ross 221411. I say I say, what a splendid evening of good old days entertainment! The Good Old Days were brought back to life when an Old Time Music Hall rocked the rafters at Eaton Bray Village Hall. Eighteen youngsters, aged ten to 18, presented a full-scale traditional old time musical extravaganza to a sold-out audience and raised nearly £1,000 for the Friends of St Mary's. Music hall chairman James Lake, dressed in top hat and tails, introduced each act with witty quips, jokes, alliteration and a bang of the gavel. He also introduced the 'orchestra' for the evening - Ros Yalden on the piano (with traditional jibes about the quality of her playing) but it was all in good humour. The opening choruses were sung by the entire company. They all looked authentic, with period costumes and props supplied by Leighton Stagecoach principal, Wendy Ashman, from Pebblemoor, Edlesborough, whose husband, Peter, directed the show and provided much of the script. The first half consisted of 14 separate acts starting with Daisy Bell sung by Sophie Yalden. Other highlights in Act One included a cheeky performance of a little-known song called What's that For Eh? by Alice O'Neill who had the audience in the palm of her hand; an hilarious comic rendition of the poem The Green Eye of the Yellow God by Heather Mullett, whose arm movements were provided by Emily Ann Varlet'; the Stanley Holloway monologue Runcorn Ferry by Sebastian Calloway (how did he learn all those lines? ); Don't Dilly Dally and Daddy Wouldn't Buy Me a Bow Wow sung by the highly talented Heather and Holly Potten; Cockles and Mussels sung with great conviction by Alex Mustoe; a touching performance of Won't You Buy My Pretty Flowers by Molly Blumsom: and a melodrama which had Freddie Marshall being henpecked by a convincing Melissa Wade before getting his revenge by selling her to the local squire, wonderfully played by a joke-cracking William Sanders (who went on to give us a classical guitar solo in Act Two). After such a slick and fast-paced first Act, the audience were ready for their lovely ploughman's supper provided by Val Trantum and her capable team. In Act Two the audience were treated to delights such as I Was A Good Little Girl, sung by Olivia Calloway, who made several gentlemen's nights by flirting with them from the stage whilst her talented sister Sabrina Calloway attracted whistles from the audience as a scantily-clad artist's model in It's Alright in the Summertime. Emily Lake gave a beautiful rendition of the little-heard Shine On Harvest Moon and the half climaxed with a performance of the melodrama The Old Red Barn which had strong comic acting from Erin O'Neill as the wronged Maria Martin and Joe Ashman as the wicked William Corder who ends up killing her - but not before he milked the boos and hisses from the audience. The evening concluded with the chairman inviting the audience to join in the final choruses in traditional style ("chiefly yourselves") and the entire cast sung and danced such numbers as Any Old Iron and Beside the Seaside. This fabulous quiz with quizmaster Keith Blackburn will still include a free supper with the questions. Bring you own glasses and drink. 7.30pm for 8pm. Just £8 per person. Teams of up to 8 people. Fabulous prizes! This event is organised jointly byEaton Bray Village Hall Fundraising Committee and Eaton Bray Tennis Club. For bookings contact Ross on 221411. Dunstable and District Orbit Club held their annual quiz on Saturday 8th March at Eaton Bray Village Hall. 19 teams took part and we raised £1,200 for BAAF, British Adoption and Fostering. It was a good night and everyone enjoyed themselves. Orbit is a social and charitable club and welcomes anyone in their 30's or older to come and join us. We meet at the Dunstable Rugby Club every 1st & 3rd Tuesday at 8pm. You will be very welcome. Re-live the Good Old Days! This article was published in March 2008. Please see Latest News for more recent information. My Lords, Ladies and Gentlemen! Your attendance is requested at Eaton Bray Village Hall on Friday 28th March at 7.30pm, where you're invited to 'Come and Make Eyes' as some of the finest young performers from the villages perform, for your delectation and entertainment, a traditional Old Time Music Hall. The evening will include all the great songs of the Victorian and Edwardian period including 'Down at the Old Bull and Bush', 'Daisy Daisy', 'Waiting at the Church' and 'Any Old Iron' along with comedy, sketches and a harrowing melodrama! The evening will be introduced and hosted by your own, your very own, traditional Music Hall Chairman. The ticket price includes a ploughman's supper and there will be a licensed bar where you can buy all the drinks you need to make the evening go with a swing! So 'Let's All Go to Eaton Bray' and imagine we've gone back a hundred years to 1908! Please dress in period costume if you like, and enjoy a good old-fashioned evening of family entertainment provided by the young people of 2008! Tickets are £8.00 for Adults and £6.00 for Children - available from Fiona O'Neill on 222058. This article was published in February 2008. Please see Latest News for more recent information. Community groups in South Beds have been urged not to miss out on valuable funding by MP Andrew Selous. He has called on groups in need of cash - including Houghton Regis Bowls Club, which is hoping to upgrade its changing facilities - to make sure they apply for grants from WREN (Waste Recycling Environmental Ltd). The company is responsible for distributing money for good causes, and in the past three years has awarded more than £250,000 to groups in the district. But Mr Selous said that the rest of Bedfordshire is faring far better, with more than £3.44 million paid out across the county in the same period. The Tory MP said: "It would be very good to see South West Bedfordshire receive an equal proportion of the funding provided among the six Bedfordshire constituencies." WREN's contact details are: WREN House, Manor Farm, Bridgham, Norfolk, NR16 2RX. Interested groups can also phone 01953 717165, or email [email protected] for more information. The completion of Eaton Bray Village Hall has been moved forward three years after receiving a grant of £37,900 from WREN (Waste Recycling Environmental Ltd). It was December the 15th, the frost lay heavily on the roads and cars, 12 very cold GI's walked alongside Dunstable Round Table's Christmas Float. The carols (well King sings Christmas actually) were coming out at a fair rate of decibels and we all felt that wonderful feeling when the children look up at Father Christmas with absolute trust and belief. The last 3 hours of freezing feet and hands is all forgotten and the thought of that young GI's (Katrina) chicken casserole waiting in the warmth oilier and Paul's home kept us going for the next half hour or so. It really does seem to put a little belief back into Christmas after all the commercialism that exists in this day and age. Talking of which, by helping Round Table on two nights and standing outside Asda for two half days we will benefit the village hall to the tune of nearly E1,000. Huge thanks to all the villagers who came out and helped. Like all organisations we are nothing without people like you. Thanks! The Village Hall Fund Raising is coming on. As you know we need to raise £10,000 by June of 2008, to add to the Wren Grant of £37,800 which we have been promised. We have had the Quiz and the 200 Club has put £2,000 into the coffers, Thanks you all who are members, December's winners are listed elsewhere in this esteemed publication. 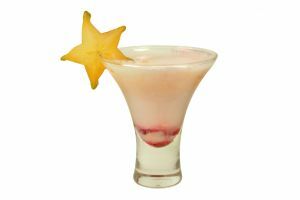 We are then running a bar at the Panto Thursday 24th January through to Saturday 26th January. After that we are holding our bi-annual joint Quiz with Eaton Bray Tennis Club on Saturday 26th April. Book early as we sold out last time! Then we have the Beer Festival in June, Friday 6th and Saturday 7th, similar format to the last 4 years. Why change something that everybody seems to enjoy. Bring on the burgers I say! Well before the end of the summer, we will have completed the majority of the major refurbishment on the Hall. I am sure everybody in the area will be delighted with the results. Following on from that, we still need to do the car park, a new partition, and many smaller items that will keep us fundraising for a few years more but perhaps not with the ferocity of the last 4 years! We hope you all enjoy the various events we hold and we really enjoy organising them. P.S. Honourable Chairman of the Village Hall did everything right this year, did not run out of fuel or get his key stuck in the ignition lock on the lorry. So I cannot even have a dig at him. Or can I? He did forget to bring the money bags at the end of one night, so we had loads of piles of cash with nowhere to put it. Does that count? Answers on a postcard please to...........! Quiz Question - What Animal Lives in a Holt? This article was published in November 2007. Please see Latest News for more recent information. Yes, on Friday 5th October, 171 people sat comfortably in Eaton Bray Village Hall to hear the Super Quizmaster, Keith Blackburn, ask that very question. We all sat and thought! Was it a beaver, was it a badger - no it's an otter! At this event, the fourth joint effort organised by Eaton Bray Tennis Club and the Village Hall Fund Raising Committee, we raised a staggering £1,400.00, which was split equally between the two groups. The Tennis Club have three newly re-surfaced courts and the Village Hall nice new toilets! Well, from Monday 8th October they did. Unfortunately, despite everyone's best efforts they were not completed until 48 hours after the quiz. However, they are really nice, so do go and try them out next time you are in the Hall! The Village Hall has also benefited from two Grants. The 1st was £5000 from South Beds Village Hall Grant Scheme and this has gone towards the toilets. The 2nd Grant of £37,000 from WREN has been promised towards our next project. This will be the re-furbishing of the kitchen, meeting room and the creation of a new disabled toilet, along with replacing the roofing above these areas. This will cost approximately £50,000, so you can see that we still need to raise more than £12,000 by next June. This project will complete the essential refurbishments to bring our Hall into the 21st Century. So please keep supporting us. The next event is being run by the Villagers and is a Race Night on Friday 16th November 2007. Tickets are £7.50, please contact Graham Chappell for tickets and more details. In December the GI's will be helping Dunstable Round Table with their Christmas Float. Some of the proceeds will come back to the Village Hall. It's really great fun going round with Santa and seeing the children's eyes light up. Any extra volunteers will be very welcome. Those of you who are interested, please contact me (Ross Bagni) on 01525 221411. Lastly, by popular demand, we are holding another Joint Quiz with the Tennis Club on 26th April 2008. So, as we sold out again in October, please book your place early. St Mary's Church will be holding a Christmas Fair in Eaton Bray Village Hall on Saturday 17th November between 12.30pm and 2.30pm. You can enjoy a Ploughman's Lunch, buy a cake for tea, win a prize in the raffle and do some early Christmas shopping without leaving the village! This year we are also expecting a visit from Santa Claus so do bring the children along. Any contributions for the chocolate tombola, cake stall, recycled presents stall or the raffle would be very welcome. Please contact Peter Bennett. The Villagers present A Race Night at Eaton Bray Village Hall, in aid of Hall Funds, on Friday 16th November at 7.30pm. A ploughman's supper is included. Bring your own drinks and glasses. Tickets available from Hall Trustees. This article was published in October 2007. Please see Latest News for more recent information. The bumper grant will enable phase three of the refurbishment to take place next year. The involves creating a disabled toilet along with a new kitchen and meeting room. Ross Bagni, of the Eaton Bray Village Hall Trustees told the Citizen: "We've got £50,000 to raise and this will help towards that significantly. It will being us forward by about three years. Usually we'd only be able to raise £10-12,000 a year so this is a massive help. "The hall will be a big boost to the village when it's done. We've spent a lot of money on making sure we've a decent 21st century hall that everyone can use." Phase three marks the end of the major work that has been carried out over the last three years. In 2004 the main hall was completely refurbished at a cost of £150,000, the main toilets have just been completely revamped along with the entrance hall (£32,000). Phase three will cost approximately £50,000 so even though some of the balance has been raied, the Hall Trustees need to continue fundraising for the foreseeable future to complete the job by summer 2008. The news was announced at a joint fundraising quiz with Eaton Bray Tennis Club. 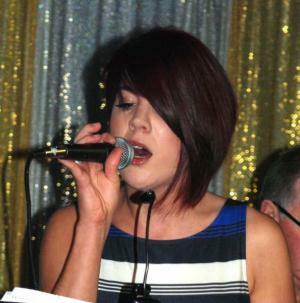 Over 170 people attended and the two organisations shared the £1,400 raised on the night. The trustees have raised nearly £250,000 over a five year period to bring the village hall up to date. They are well aware that the hall will continue to need minor improvements over the next few years, along with regular maintenance and their efforts will continue with regular events, including a beer festival (first weekend of June), quiz nights, and other social events that bring the villagers together to help in maintaining this vital village facility. I'll be honest this is going to be a very quick report as this sad old git (G I), went on holiday for 10 days immediately after the beer festival so I have got to write this very quickly or the honourable editor will not let me get it into print (if you see this then you know, as I do, that she is a very kind person). The weather was just as good as last year and even though we did get more beer, burgers, sausages, potatoes, fillings and other alcoholic drinks along with the soft drinks we had almost sold out of everything by late Saturday and that was after a slightly quieter Friday (we think due to England v Brazil football match). On Saturday the weather blessed us again and by early afternoon lots of families had turned up to watch the magician and then stayed in party mood 'til late into the evening. Our biggest thanks must be to those who turned up to enjoy the Festival, but the sacrifices the CAMRA volunteers made just to make sure that every pint was up to their usual high standard were well beyond the call of duty. They did so much tasting that they had to get a taxi home each night! Again it is the G I volunteers who also make it possible and our thanks to all of them. With all that effort how could we fail? The final profit is in excess of £3,400. All this will be going into the work to be carried out on the toilets in the very near future. Thank you all for your support again. We will definitely start planning the 5th Beer Festival which will take place on the first weekend of June 2008. Don't forget! To more immediate things, our next event is a joint quiz with the Tennis Club which is to be held in the hall on Friday 5th October. We sold out last time so please book your places early. More details from Ross. P.S. Where did I go on holiday? This is really sad but I loved it. I rode 1,600 miles around the UK on my motorbike visiting friends and family and enjoyed it tremendously. Makes coming back and writing this all worthwhile. This article was published in June 2007. Please see Latest News for more recent information. The trustees of Eaton Bray Hall invite ALL villagers to see the plans for the refurbishment of the existing toilets due to be carried out this summer. The trustees would also like to discuss with you the progress being made towards the next major phase of the refurbishment, which will include a disabled toilet, creation of a meeting room along with a completely refitted kitchen and completion of replacing the present roof. It is important to the trustees to have your input. Old & Young GIs Unite to Take First Prize at Largest Ever Quiz! On Friday 29th April the Village hall was throbbing, with 173 eager minds just waiting for the off. Keith Blackburn (the greatest living quiz master in Eaton Bray) took the microphone and we were away. What a night, with difficult questions great banter, as exceptionally talented teams fought it out to become the champions. In the middle of all this we had a lovely supper and I didn't win one of the fabulous prizes in the raffle. Still you can't have everything, can you? Into the final round and 5 teams at the top could all win the title. "Art's Cool" led "The Team with No Name" by just half a point. After the last round with all the contestants waiting with baited breath while Keith in classic style announced the results in reverse order.......at last the final result: The Team with No Name were winners by half a point! Well would you believe who was in the winning team? Yes the old and young GI's united in their brilliance (well actually it was two of our guests who answered 90% of the questions) but we will happily take the glory. Perhaps even happier was the Mary French team who had a great evening and went away with a large carton of Celebration for being the best non winners. Congratulations ladies. The real winners, The Village Hall and the Tennis club, who will split the £1,483 profit between them. Our thanks go out to all the villagers and guests who come along and make the organisers life so easy. A special thanks to Keith who gives up a lot of time to make these quizzes so special. And so onwards, towards our 4th Annual Beer Festival on Friday evening 1st June and all day Saturday 2nd June, with the beers chosen and served by volunteers from CAMRA. We will be having 14 beers, 2 ciders and a Perry, not to mention lager, wine and soft drinks for non real-ale types. We will also have entertainment on both evenings plus a magician for the whole family on Saturday afternoon. Hope to see you all there. Again thank you all for your support for the quiz and as I had to turn 3 people away on the morning of the quiz book early for our next one, Friday 5th October Eaton Bray Village Hall. This article was published in May 2007. Please see Latest News for more recent information. 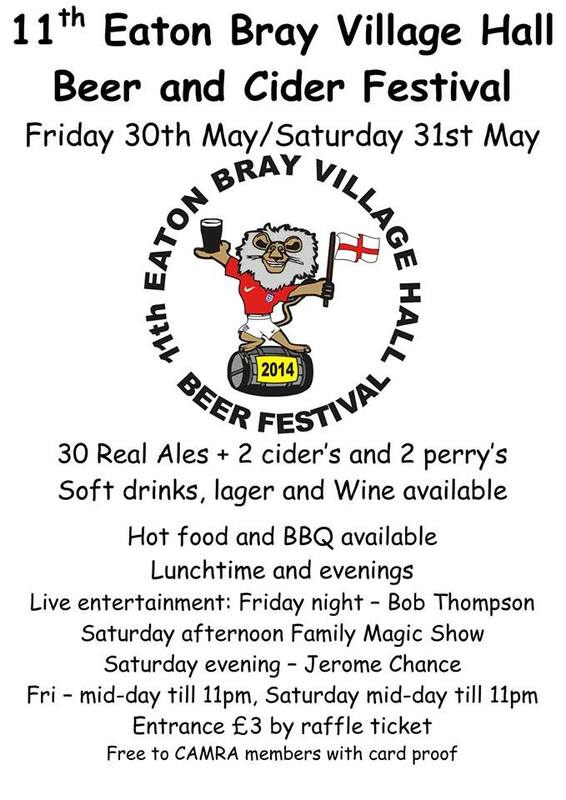 The Eaton Bray Hall Fund-raising Committee and volunteers from CAMRA are joining forces to stage the village's fourth annual beer festival. The event will be held in Eaton Bray Village Hall on Friday June 1 and Saturday June 2. The two groups aim to raise money for the refurbishment of the hall. The festival will run from 6pm to 11pm on Friday evening and from 12 noon to 11pm on Saturday. Visitors can sample 16 real ales, two ciders and two perrys, all organised by volunteers from the Campaign for Real Ale. The non purists can get lager, wine and soft drinks from the hall committee volunteers, who will also run a barbecue and baked potato stalls. Live entertainment on Friday evening will be supplied by Bob Thomson. There is a special magic show for children on Saturday afternoon and Paul Green (Greenie) will be there on Saturday evening to help everyone dance the night away. Proceeds from the event will help to revamp the toilets and to bring the hall into the 21st century. Note: This article describes the 2007 event. Soft drinks, bottled lager and wine available. This annual event now in its fourth year will have over a dozen real ales plus Cider, Perry and various lagers and wines for non Ale drinkers. Food and entertainment on both days will add to the atmosphere along with Saturday afternoon when we will have a children's magician so all the family can have a great time. Dunstable & District Orbit Club held their Annual quiz night recently at Eaton Bray Village Hall. 18 teams entered and we raised just over £1,200 for the Paul Strickland Scanner appeal for Mount Vernon Hospital. The quiz was in memory of a very dear friend and member of Orbit who left us recently. A few weeks ago the girls of Orbit arranged a "Boy's Night" for the boys. The boys came as scouts and the girls as guides. to celebrate 100 years of scouting We had games, worked for badges, sang round the campfire and had great fun. Orbit meet in the centre of Dunstable every 1st & 3rd Tuesday at 8pm. For more information please contact 01582 755147 or 01525 222441. Ever seen the Chairman hot wiring a truck? This article was published in February 2007. Please see Latest News for more recent information. They say, "the young never feel the cold". Well it may be true but us old GI's certainly do. Along with a lot of helpers from our community we took over the Round Table Float for 3½ nights/days to help raise money for the Round Table and the Village Hall refurbishment. To be honest it wasn't that cold and walking round the houses seeing all the children so delighted to see Father Christmas outside their homes was worth the odd 5 mile walk. We have raised over £1250 from the efforts put in by many people. You know who you are but we again say thank you! What's this about the Chairman hot wiring a truck? Well it all started 3 years ago when the same gallant GI forgot to check the diesel in the lorry and we had to hang around while he and an elf went to get some. This year he went one better. As I was arriving, a little late at Asda, a couple of Saturdays before Christmas, I rang the said person to say sorry for being late. He told me not to worry as he was locked out of the lorry with the float on and the key was broken in the ignition. Some two hours later a "very nice man" came from a breakdown company and got the key out and showed Nor... oops sorry nearly gave the name away there, how to hot wire the lorry. This, he has been doing ever since! Since this bit of education, I have been locking my car in the garage (and I don't even have one)) you can't be too careful. All GI's, old and young(ish) would like to thank everybody who has helped us in Fund Raising during 2006 and wish all villagers a very Happy and Healthy New Year. The 4th Annual Beer Festival, similar format to previous years, Friday June 1st and Saturday 2nd June, in the Village Hall. More info to come. Just put the dates in your diary and get extra aspirin in! Last, but by no means least; the Villagers are holding a Race Night on Friday 4th May 2007. All proceeds will be going to the Village Hall refurbishment fund. So if you fancy a little flutter look out for further information later on. This article was published in December 2006. Please see Latest News for more recent information. The Village Hall fundraisers are operating Dunstable Round Table's Christmas Float on December 2nd, 9th and 13th. The float is staffed by our volunteers, of which, we can always use more. Free food and drink afterwards! If you want to volunteer for a brisk walk then please contact Ross. This article was published in November 2006. Please see Latest News for more recent information. That was the question on everybody's lips at the Largest Quiz ever held in the Village Hall on October 6th! YES. When the old GI's (Village Hall Fundraising Committee) got together with Eaton Bray Tennis Club to organise this great Quiz Night, none of us realised that it would be a sell out and that we are now about to be entered into The Guinness Book of Records, as the Largest quiz ever held in Eaton Bray. We expect ratification within the next few weeks! The benefit of these numbers was a massive £1,300 to be shared equally between the toilets in the Village Hall and a load of tarmac at the Tennis Courts. Thanks to all of you who came and helped it to be such a success. A special thank you to our quizmaster Keith Blackburn who volunteered his services to set totally impossible questions (well for some us anyway). The saddest part? Well, as a member of the winning team last time, it was being beaten by the 2 youngest GI's (no names to protect the innocent) Katrina & Paul Hurley led a team to first place. I suppose congratulations are in order to them and their obviously very intelligent friends. Honestly no hard feelings on my part. We hope you all enjoyed yourselves AND if you did, we are all doing it again next year, on Friday 20th April. Same venue, same quiz master, BUT unfortunately different questions! This article was published in April 2006. Please see Latest News for more recent information. Note: This article describes the 2006 event. 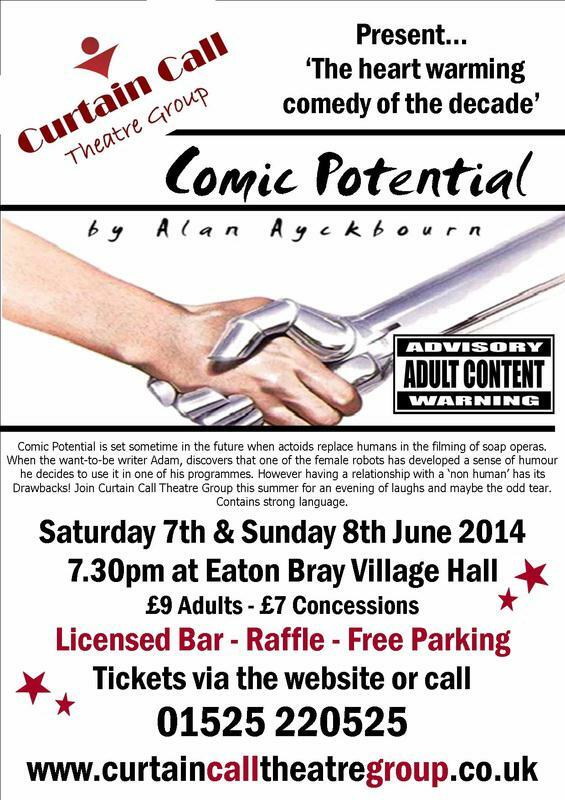 This event raises a lot of money for Eaton Bray Village Hall. The trustees would be delighted if you could spare some time of the weekend to help run it. Please see Sally Taylor if you can help.